The new CPs take inspiration from the CP70 and CP80. PRESS RELEASE: The introduction, over 30 years ago, of Yamaha's groundbreaking CP70 and CP80 stage pianos was a life changing experience for keyboard players in search of a compact and portable instrument with a true acoustic sound and feel. These iconic CP instruments were to revolutionise creative performance options for gigging pianists and tour managers. Over the years the CP range has gained massive popularity, creating some of the most enduring images in the hands of internationally acclaimed artists on stages all over the world. Today the legend is reborn as Yamaha unveil a stunning new 3-strong range of CP pianos (CP1, CP5 and CP50) headed up by the revolutionary CP1. An instrument that can accurately be described as the ultimate digital piano, the CP1 is also an instrument that Yamaha is uniquely placed to build, thanks to it's exceptional acoustic piano heritage. This no-compromises professional stage piano maintains the original 'CP' product concept but now boasts newly developed technology and functionality. The heart of any piano is its sound, and the CP1 has a completely redesigned core sound technology. Its unique Spectral Component Modeling (SCM) tone generation system recreates the sounds of pure acoustic and classic vintage instruments with a degree of accuracy unmatched by any other digital instrument. There's even a stunning set of original DX keyboard sounds! The architecture of the modeling system perfectly compliments the exceptional creative expression offered by the newly developed NW-STAGE wooden key action which draws on Yamaha's 100 years of expertise in producing keyboard actions - actions which have been praised by prominent artists around the world for their consistency and balance. Featuring synthetic ivory topped keys, the action offers perfect playability and authenticity by minimizing vibration and distortion - a keyboard mechanism that quite simply makes the CP1 the most expressive stage piano ever created. The Spectral Component Modeling concept is a fundamentally different approach to any other technology previously employed by Yamaha, combining ultra sophisticated sampling and modeling technology. All sounds can be comprehensively and easily edited, then further customized by adjusting the parameters of 'physical' components including hammer stiffness and striking position. It's a lot more than just sampling! The CP1 can also function as the heart of a complex performance setup thanks to its sophisticated, yet user-friendly master keyboard functions. For example, up to four virtual zones can be set up along the keyboard and assigned to separate tone generators, including external MIDI devices. The spirit of the original CP pianos lives on through the design and ergonomics of the CP1 with classic wooden side panels and a vintage textured top panel invoking iconic instruments of the past. These traditional features are also matched by state-of-the-art functions including the brilliant vacuum florescent display, and brushed aluminium knobs and switches. All these elements come together to produce a highly attractive and eye-catching performance instrument. The middle model of the new CP lineup, the CP5, offers a huge and varied sound set of over 300 voices which will appeal to discerning users who require a wide range of voices from a single keyboard. Using some of the CP1's Spectral Component Modeling facilities, the CP5 additionally features many of the sounds from the award-winning Motif XS range of synthesizers. 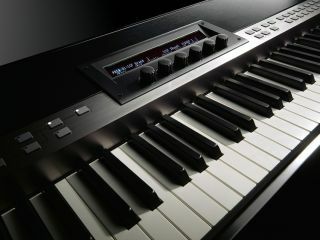 The CP5 is also ideal for education and composing thanks to the onboard record and playback functions. Performances recorded and stored as audio files on USB flash-memory devices may then be perfected with the bundled Cubase A15 DAW software. Completing the new CP range is the highly affordable CP50, a compact and lightweight professional piano which also features a sound set based on the flagship CP1, thanks to the Spectral Component Modeling System. The CP50 offers over 215 voices and, like its range partners, also offers the ability to customise sounds and effects. The 88-key Graded Hammer action faithfully reproduces the feel of it's traditional counterparts by producing a heavier response in the lower register and a slightly lighter touch in the higher keys, exactly like an acoustic instrument. The CP50 also offers record and playback functions as well as a range of professionally arranged rhythms for added live performance options. The flagship CP1 is available from the end of January 2010 and will have a recommended retail price of £4502 including the new 17.5% VAT rate. The CP5 and CP50 are expected to be available from March 2010 with prices to be announced at that stage.